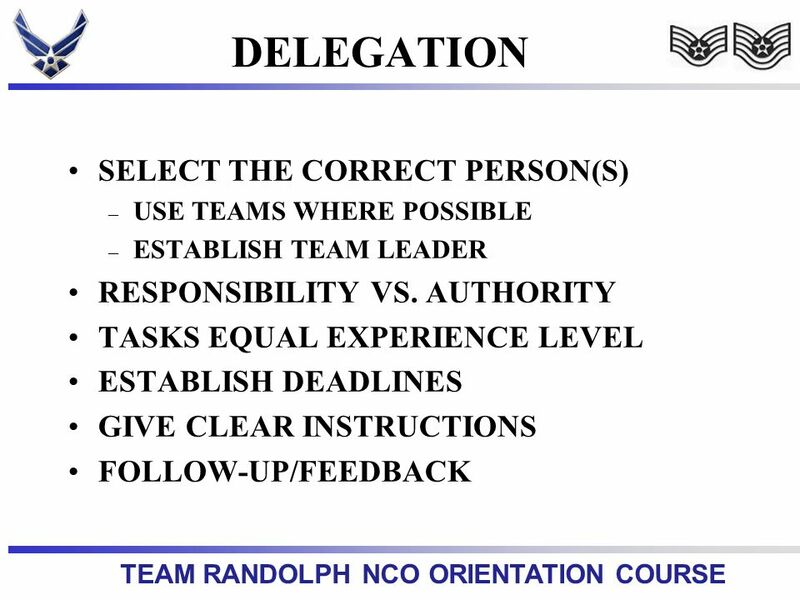 15 TEAM RANDOLPH NCO ORIENTATION COURSE PARETOS PRINCIPLE Eliminate the Trivial Many 80% and focus on the Vital Few 20% Review your activities and determine which are the Vital Few that will provide the maximum value towards accomplishing our most desired goals. 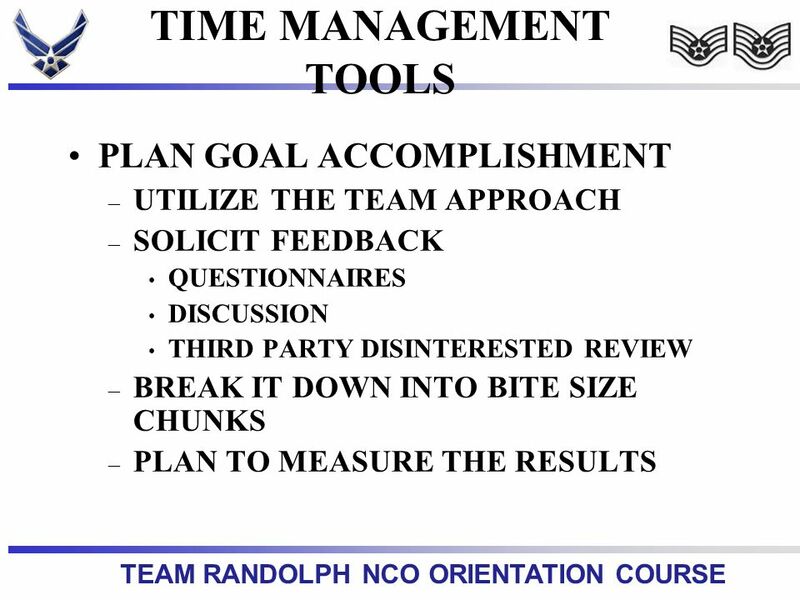 17 TEAM RANDOLPH NCO ORIENTATION COURSE Conclusion Time Management begins and ends with the individuals efforts to plan, organize and control the valuable asset of time. 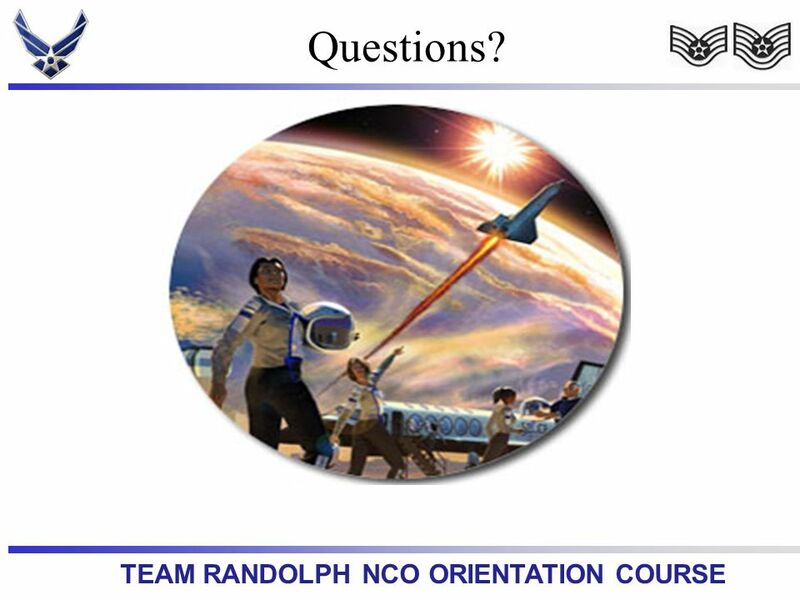 18 TEAM RANDOLPH NCO ORIENTATION COURSE Questions? 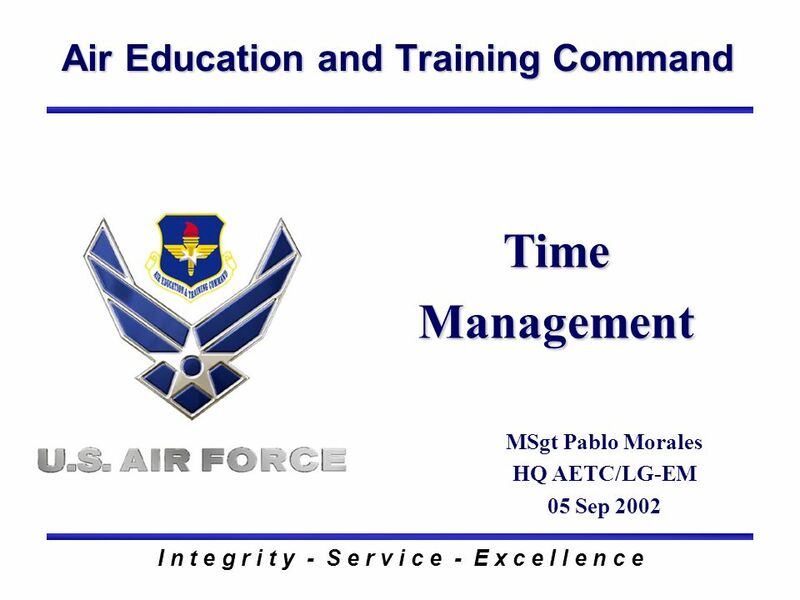 Download ppt "Air Education and Training Command I n t e g r i t y - S e r v i c e - E x c e l l e n c e Time Management MSgt Pablo Morales HQ AETC/LG-EM 05 Sep 2002." OR WHY YOULL NEVER GET IT ALL DONE! 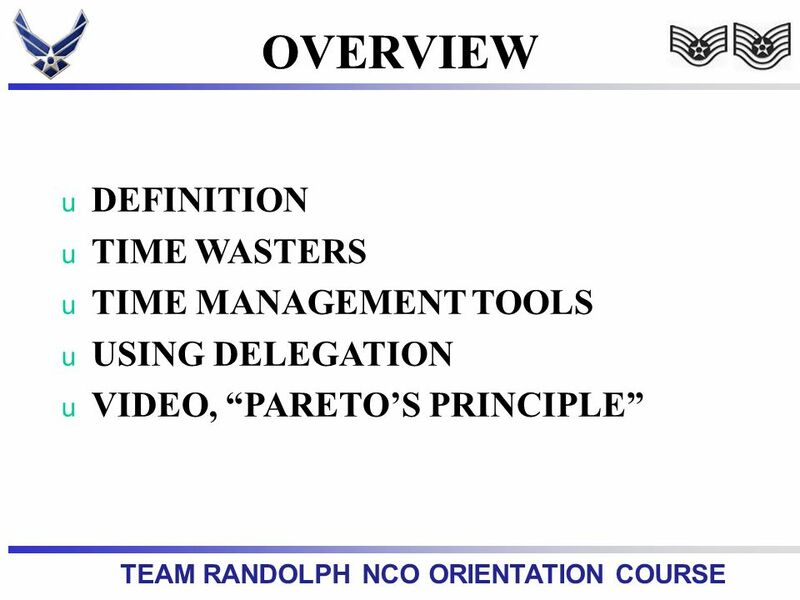 Larry Hart – TEC Chair Atlanta, GA.
Time Management. 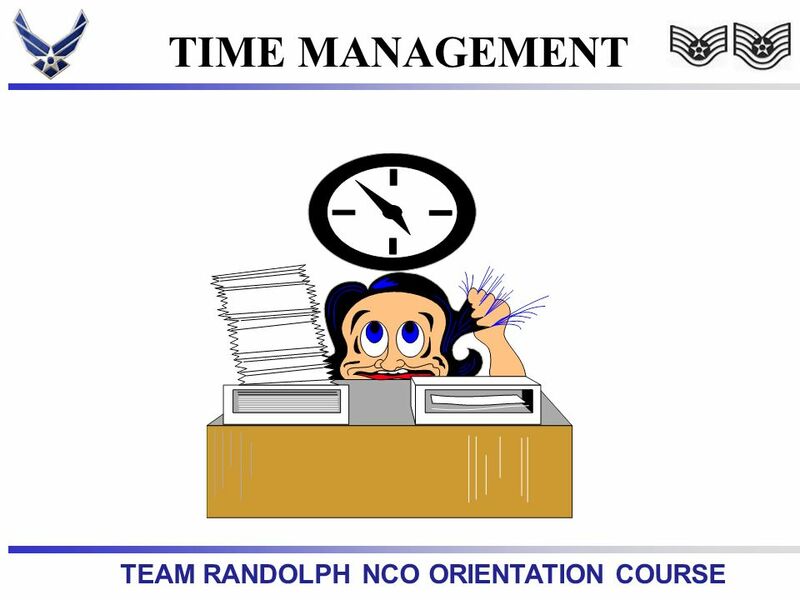 Objective To utilize the resources and information offered to enhance our time management skills so that we can be more productive and. 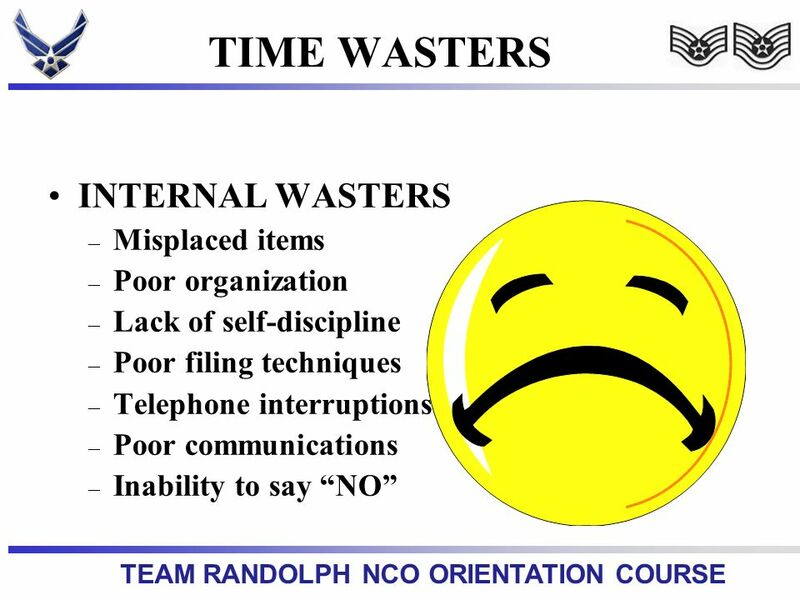 Air Education and Training Command I n t e g r i t y - S e r v i c e - E x c e l l e n c e Counseling MSgt Luis Adams 12 CES/CEOI 5 Sep 2002. 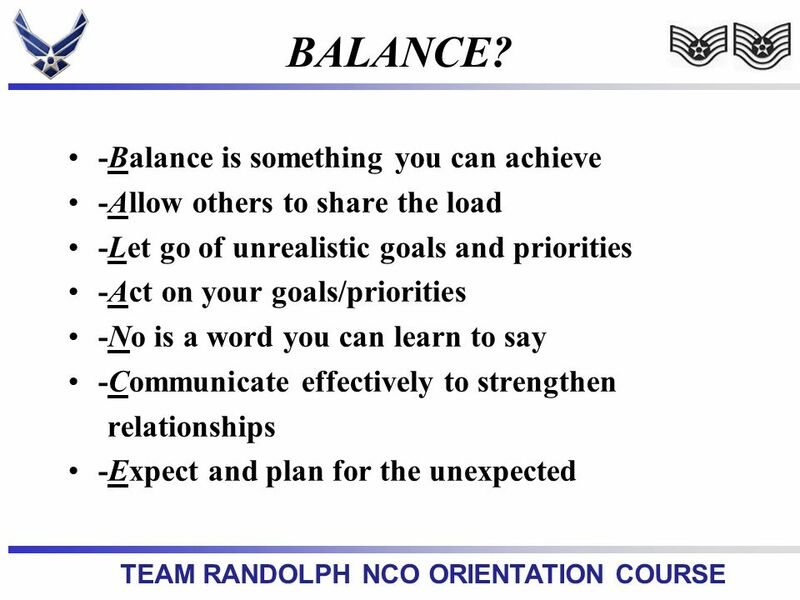 Air Education and Training Command I n t e g r i t y - S e r v i c e - E x c e l l e n c e Interpersonal Relationships & Team Building SMSgt Bobby Harris. 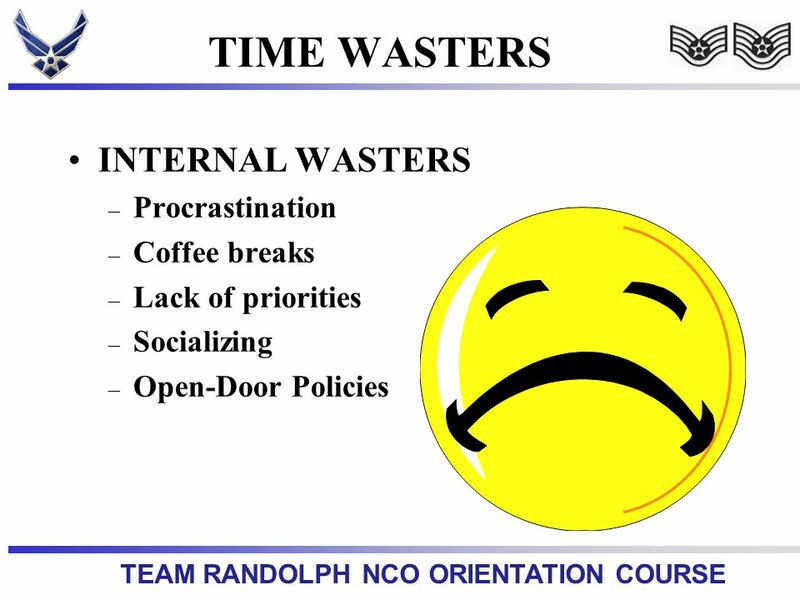 TIME -- The Current Reality Indicators of Time Problems How Do You Spend Your Time? 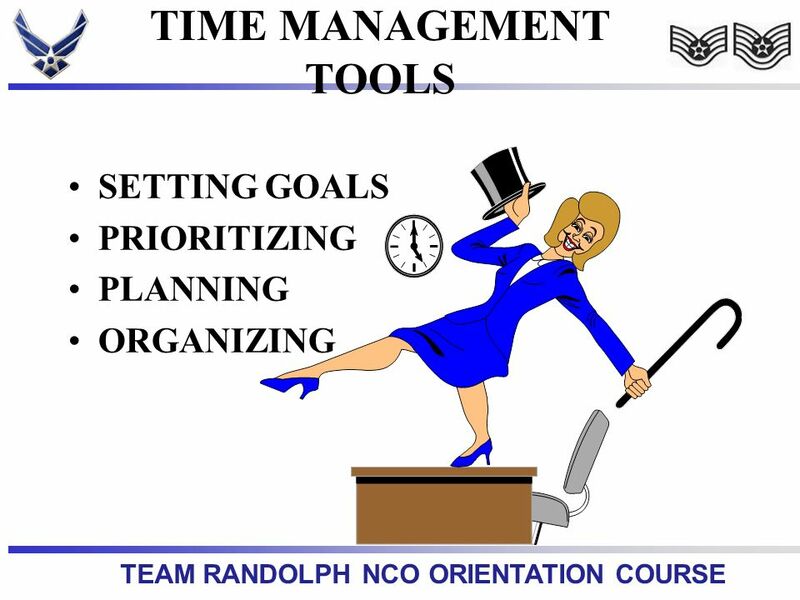 The Best Time Management System Strategies: Overcoming Time Wasters. 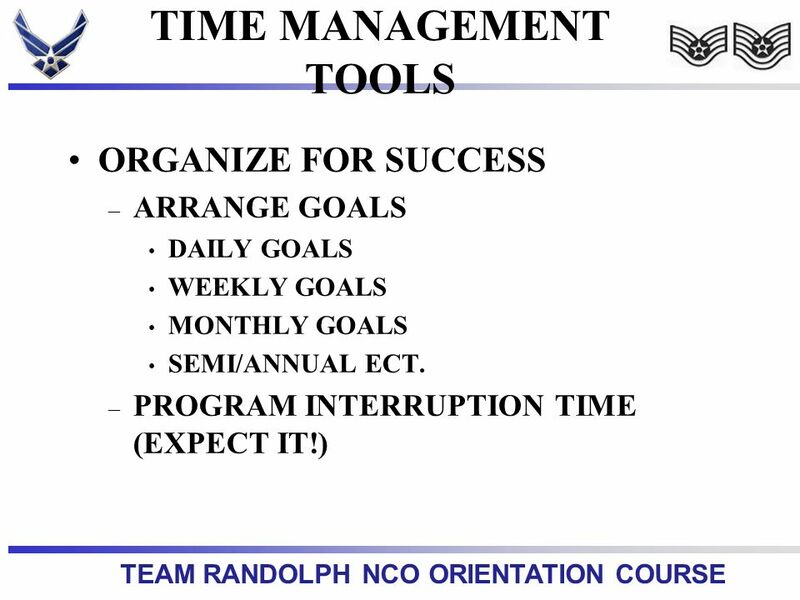 Time Management Tips for the Multitasking Research Administrator Source material taken from Eat that Frog! A book by Brian Tracy Presentation by Trish. 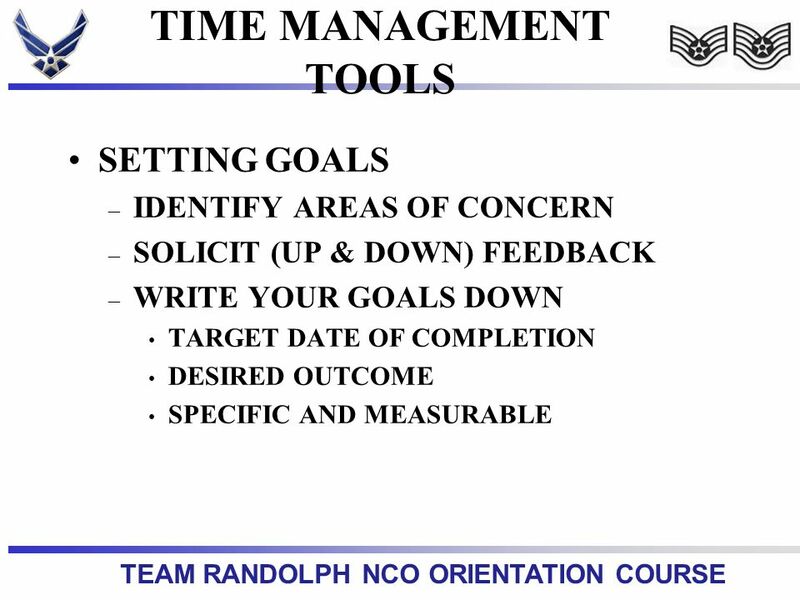 TIME MANAGEMENT APAMSA Leadership Development Module. 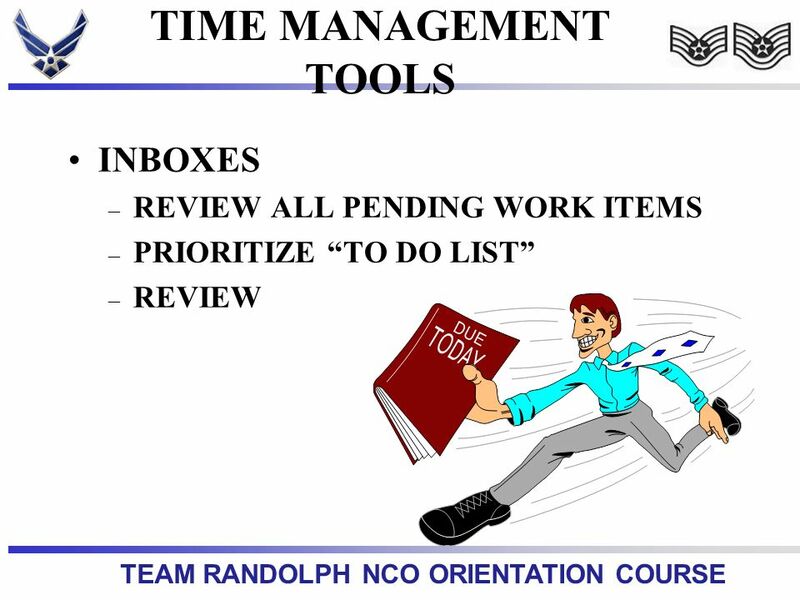 Time Management By Zahira Gonzalez. And Achieving More for Your Effort. Overview Why should I care? 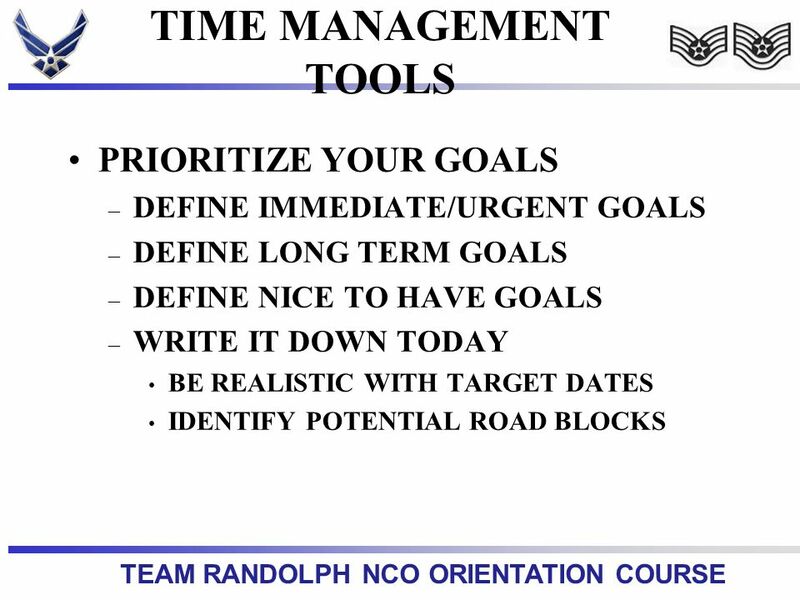 Poor time management Common roadblocks Where to start Extra help How this applies to SNCOs. 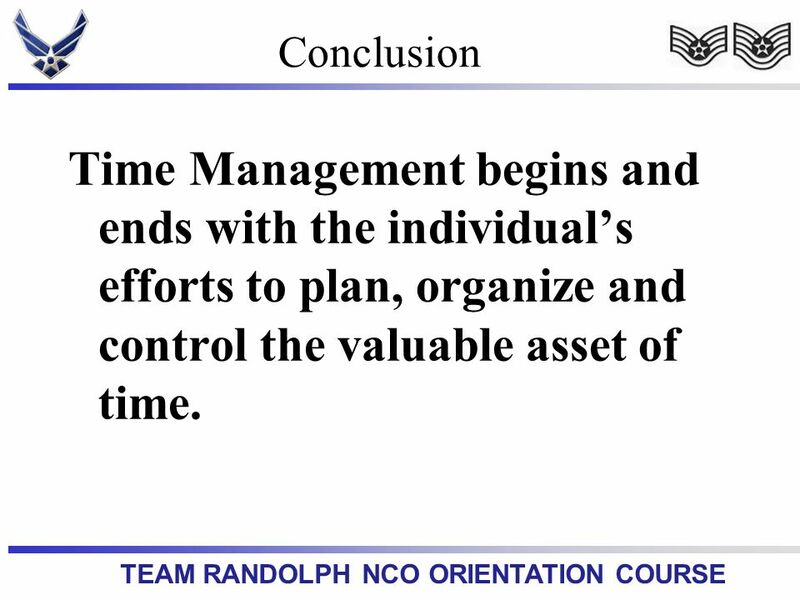 The Management Series: Time Management. 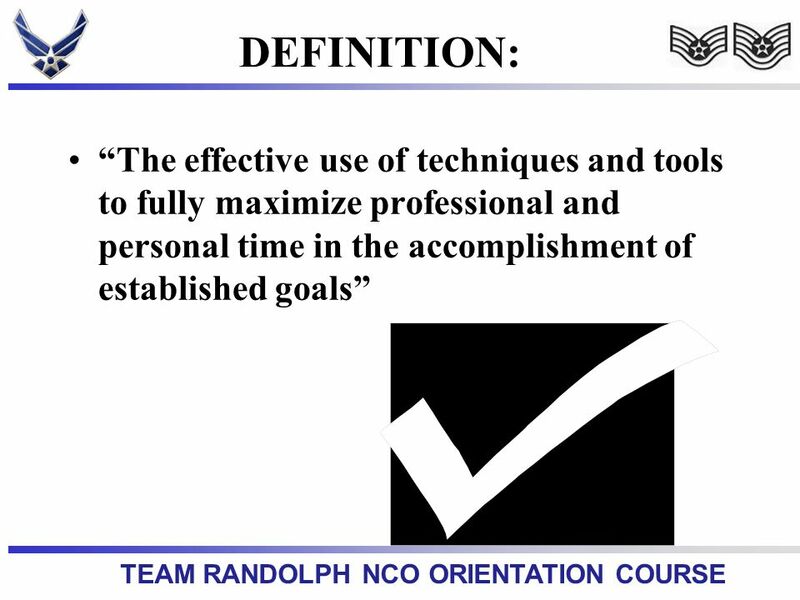 Objectives Upon the completion of training, you will be able to: Understand What Time Management Means Learn To. IExpert THERE IS A WAY - Organizing Self. iExpert “To become a ringmaster, you must realize that there’s a time and a place for everything. Successful.